Strength in Numbers is the third scenario of Session 2 of the Arkham League. It was first published on March 11, 2009. No clue tokens start on the board, and no Investigators start with any clue tokens. For every 3 clue tokens you wish to keep at the bank, every investigator must take a corruption card. Any investigator with 3 or more corruption cards must take a cult membership. Any investigator with a cult membership may not trade with any investigator without a cult membership. 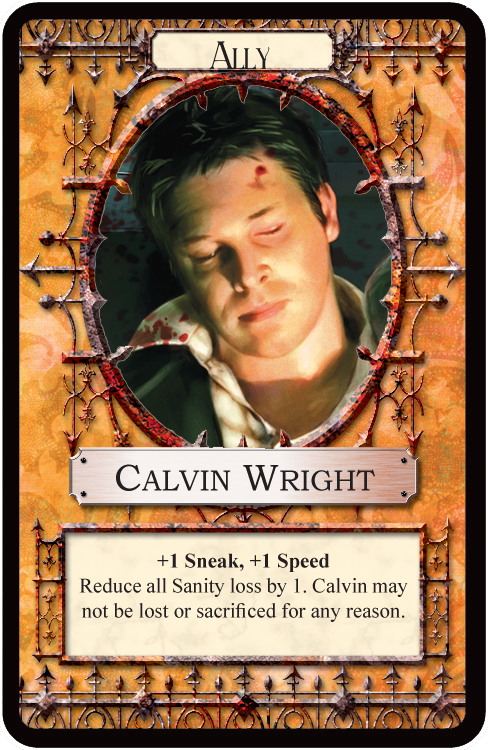 Any time an investigator passes an evade check on a cultist, they must take a corruption card. Calvin must be taken as an ally, he replaces a unique item. Only investigators with a starting unique item may take him. All cultists move every round they are in Arkham. Cultists move on black, when they move. This move supersedes any other movement they may do. No, the +4 win condition is no longer a valid path to victory. It may return, but it will say so in the rules. Clue banking works the same as Scenario 2, provided you are willing to corrupt yourself to gain those clues. The clue tokens must be banked in sets of three, and yes they are the clue tokens from the previous scenario. All characters from an expansion begin the game with the items listed on their card. The scenario will mention if this is not the case. When adding Dunwich, only the listed things are used. No board, no common items, no Mythos... not yet anyways. Clues banked at the bank do count towards the maximum that can appear. Any time an investigator has 3 or more corruption cards, they must take a cult membership. This can be during setup, or during the game itself. The evening passed quickly, dinner provided by Ma. I spent most of the time in my room, worrying over the return of Jenny. The night grew long, and my fear begins to overtake my thoughts. What if she is hurt, kidnapped? What if those creatures did make it here? What was that noise? Why am I am here? How am I going to find Ella? These thoughts dance through my mind, refusing me the solace of slumber. I toss and turn for what seems an eternity. The moon staring down on me through the window seems to have a grimace, its ever growing face seems pained. Tonight it is at half strength, though its light is shining full force upon me. A knock upon my door sends me under the covers. "Who is it?" I fear the answer. No response. The rapping resounds again. "Who is it?" I hear muffled voices in the hallway, "McGlen, it's about Louie." I go to the door, "My name is Calvin Wright. Mr. McGlen was taken by the police earlier today." The voices, though muffled by the door, seem disturbed by this turn of events. I hear them argue, then the footsteps retreat down the hall. I listen to the footsteps fade away, then open my door. The hall is empty. I approach Jenny's room. Though it is unbecoming of a man to interrupt a lady's slumber, I fear I must know if she is safe. I knock softly. No answer. I knock a bit harder, and begin to worry. I knock fairly loudly, loud enough I fear I may disturb my fellow boarders. The doorway creaks open, and a sliver of Jenny's face appears. "Yeah?" I say that I am merely checking to make sure she is safe, and excuse myself. I head back to my room, and sit on the bed. I lay my head upon the pillow, and find myself asleep as soon as I do. bedclothes, but can not awake. I feel these images seeping into my very core. I am very very cold, and wet, and the images flee before my rising consciousness. Jenny stands above me holding a pitcher. "What in the hell are you blathering about? Tentacles and blood? Horns and ice?" It takes me a moment to focus. "Nothing, nothing. Horrid dreams." Jenny seems to accept this. "I'll be waiting for you downstairs. Joe has some information that might be of use to you." I nearly break my leg leaping out of bed. I throw dry clothes on and dash downstairs. Joe sits nursing a cup of coffee chatting with Jenny, Ma, and the professor from the day before. "What is it? What did you find out?" Joe smiles and sets down his cup of coffee. "Ease up there, you'll hurt yourself. I was talking with the prof here, and he found an entry in a book. Something called Unowss, Uneawss, something cult." I turn to the professor, who is chuckling over Joe's pronunciation. "I believe the name you are attempting is Unaussprechlichen Kulten. Roughly translated as nameless cults, it details a number of cults around the world, as well as some of their activities. After re-reading the copy held at the University, I found a number of entries pertaining to disappearances in relation to wooded venues, as well as a number of entries on towns being attacked. Both seem to point to a specific group, the Cult of the Hundred. I am as yet unsure of their influence or penetration of Arkham, and advise against pursuing them until I can ascertain the exact group." I nod dumbly, shocked that the professor can speak so openly about a group who openly consort with beasts. He seems remarkably calm for a man discussing the potential for a group of people who are kidnapping and murdering. "You all right?" Jenny places her hand on my arm, the contact seems to make the horrors easier to digest. I must try to be as strong as she is, though she must be beside herself with worry for her sister. I look to Joe and ask what our next move will be. "Well, I have a couple of things to check out. Why don't you and Jenny join the professor here, and head up to the University." Jenny looks skeptical, but I agree without questioning it. Lost amongst the books and scholars of the University, I feel I will be safe from the predations of my imagination. Having decided on a course of action, we break up and go our separate ways. Jenny and myself accompany Professor Walters to his office, and Joe heads off into the town proper. The sound of the bells and seeing all the students generates a sharp pang of loss in my heart. It was only a week ago I was teaching at my beloved school. Going home to my Ella and our son. A tear escapes my eye, and runs down my face. I fear the pace we are setting will be too slow to rescue my love, and my former life. The professor calls my name, and I snap out of my reverie. We enter his office, and I am awe struck by the towers of books he chooses to surround himself with. Piles easily six feet high, each precariously balanced. I spy Miss Sharpe moving past the stacks near the rear of the room. She comes forward and shakes my hand. We discuss what needs to be found, and the easiest way to find out the information. Jenny and I pair up and begin searching the spines of the tomes for specific titles. Miss Sharpe and the professor begin going through the books Miss Sharpe set aside the night before. I will spare you the tedium of Jenny and I searching the stacks, and merely say it produced little fruit. What little we did manage to find was quickly picked clean of information by the two scholars. The bell tolled thrice, and Miss Sharpe departed to work at the bank. Precious little was found after that, and nearing 6, we left the office of Professor Walters. This page was last modified on 23 December 2009, at 09:31.